Knitted fabric differs vastly from woven fabrics. Woven fabric is formed substantially by interlacing of a series of lengthwise and crosswise threads. 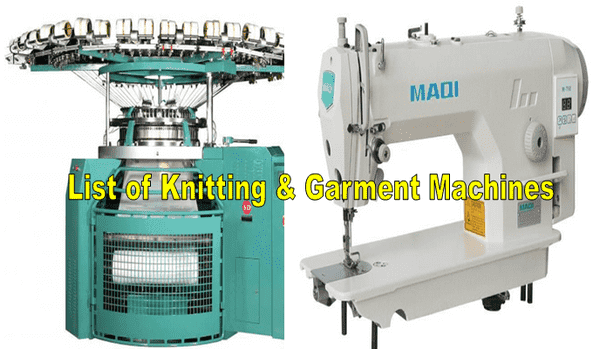 Knitting is the process in which fabrics are produced by set of connected loops from a series of yam in weft or warp direction is called knitting.. The basic element of a knit fabric structure is the loop intermeshed with the loops adjacent to it on both sides and above and below it. The knitting industry belongs to the branches of the textile industry with long tradition and the knitted goods have been known for centuries. In the early days they were made by hand but now a days various kinds of modern knitting machinery are used to produces knitted fabric. Those knitting machineries not only highly productive but also capable to produce quality fabric. Here I am giving a list of the most used knitting machines in knitting industry. Knitting are two typs; warp knitting and weft knitting. So knitting machines are also two types; warp knitting machines and weft knitting machines. Weft knitting machines can be classified in different way. Such as According to the frame design and needle bed arrangement or construction, according to the number of needle bed or number of needle set used, according to the end product of the weft knitting rnachine, according to the basic structure of the weft knitting, according to the types of needle used etc. Clothing or garments protect the human body from extreme weather and other features for the environment. Clothes are worn for resignation of shame, safety, comfort, modesty and to reflect religious, cultural and social meaning. Ancient people used Grasses, reeds, leaves and stems to cover their body of purely the vegetable origin. And then they started to use the skin of animals as to wear as their clothes. Now a days various fashionable cloths are manufactured by using different types of machineries. In this article, I will give list of machineries used in apparel manufacturing. In garment manufacturing, different types of spreading machine, cutting machine, sewing machine, fusing and interlining machines are used. Now I’m giving just few widely used cutting and sewing machines list. Straight knife of Cutting Machine. Computer Controlled Knife Cutting Machine.